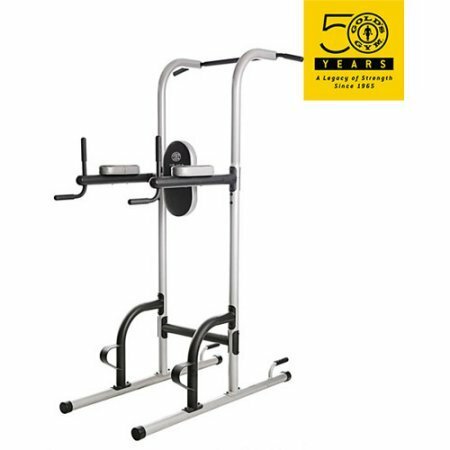 Push, pull and lift your body into better shape with the Gold's Gym Vertical Knee Raise / Power Tower. It features several different stations that allow you to engage in a wide range of upper- and lower-body routines. This workout power tower's vertical knee raise station can be utilized to help develop your core and legs. The connecting dip station can be used to build the triceps, chest and shoulder muscles to gain significant upper-body strength. For added resistance, weights can be attached to the waist or ankles during those exercises (weights sold separately). The push-up station is equipped with padded push-up hand grips to help you get the most out of your push-up workouts. This machine's pull-up power tower component can be used to build stronger and more conditioned arms. If you have any questions about this product by GG, contact us by completing and submitting the form below. If you are looking for a specif part number, please include it with your message.